The $60 a Week Project, what’s that? Hi! My name is Marianne and I’m unemployed gainfully employed but after eight month of being unemployed, I’ve learned a whole lot about living frugally. Now that I am employed, I don’t hold myself to a $60/Week grocery budget but I still try to get the most bang for my grocery buck. I was laid off in early-December 2008 and, as a result, my partner and I had to trim our household budget. One of the line items that was cut was our food budget – both eating out and groceries. Well, the eating out bit has been just about eliminated from the budget and I have become a super home-economist who is responsible for feeding my partner and myself on a mere $60 a week. A friend, when I told her that amount said “$60 a week, I spend like $60 a trip!” Now, I’ve been doing this for three months now, I’ve got a pretty good routine going and I thought that, moving froward, I’d share. The idea for this project came about in a couple of ways. First, the local news had a special on how to grocery shop on a budget. They had a dietitian go grocery shopping with the reporter and she gave tips on how to shop, things like use the circular, buy stuff on sale, look at the price per unit, etc. None of these tips were new to me (even before I was shopping on a budget) and I kinda thought the piece was a waste of time. Second, whenever Gist (my partner) or I talk to people about the fact that I’m unemployed the conversation always comes around to budgeting and how we save money while still managing to do fun things*. Our biggest money-saver is food. We don’t go out to eat nearly as often as we used to (seriously, we used to eat out a lot) and our weekly grocery budget is $60 a week. And that’s where people’s jaws drop. No one can believe that we manage to eat – good nutritious food – on $60 a week. And while I am used to that number now, when we first re-tooled the budget that number surprised me – our previous grocery number was double that and we were going out to eat. The $60 gets withdrawn in cash on Monday and has to take us through Sunday’s supper. Sometimes I go over my $60. It happens. I don’t worry about it. Gist doesn’t eat red meat, pork or poultry. I don’t eat seafood. I was a vegetarian during the years when I was learning to and getting comfortable with cooking. We (for the most part) eat vegetarian at home. This bullet right here saves us a lot of money. I cook a lot, and always have, so I have a really well-stocked pantry. This also helps save money. I shop almost exclusively at Market Basket. For those of you not in the Boston area, Market Basket rules. Seriously, it does. I haven’t always felt this way but I do now. Market Basket is a supermarket that prides itself on its low, low, lower than low prices and they deliver. What they lack is ambiance (although I must admit I have grown to love the Basket experience.) Imagine a supermarket of yore, like where you picture your grandma in the 50s shopping – you know, linoleum tile, small aisles, no frills… That’s Market Basket. Here’s a picture, at Christmas which the Basket totally rocks! Now imagine that store jam-packed with hordes of shoppers. Like, shoppers everywhere. 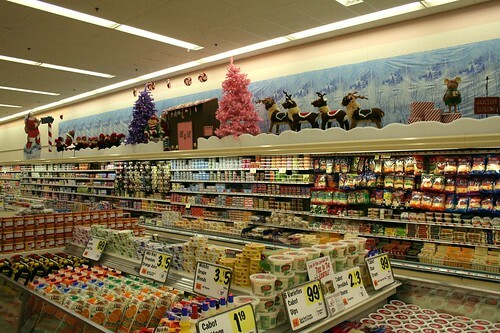 (See, that picture up there is an anomaly – Market Basket is never, ever that empty.) Like, can’t move packed. That’s the experience of shopping at the Basket. 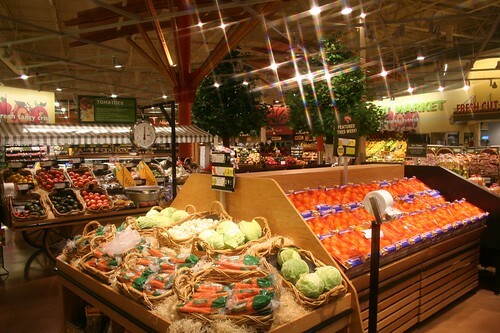 I won’t lie, I used to avoid the mayhem of the Basket at all costs, preferring to shop at the more “upscale” “New-Hannaford”** (picture those fancy-supermarket wood floors, artfully arranged produce, a huge organics section.) Now, I still love my Hannaford but I have learned a few things about the Basket. The mad crush of people shopping at all hours (seriously, it’s packed all. the. time.) means that there is a lot of turnover in the stock. High turnover = maximum freshness. Until I started shopping at the Basket, I had no idea how far away a sell-by date could be. Market Basket has a really decent organics section. It may not be a separate section within the store, complete with bamboo flooring, but they carry the products. And the Basket’s organic produce costs as much as Hannaford’s conventional produce. The “fancier” items that we like go on sale a lot and often have really far away sell-by dates which means we can stock up. For most of February Greek yogurt was on sale for 4/$5 – that’s a great price. I bought a lot. Trader Joe’s also has really great prices on a lot of items. I don’t like their produce and can’t usually get everything I need there but if I’m in the area, I’ll check it out. Gist and I signed up for our CSA*** again this year. It’s a big initial investment but it ends up saving money in the long run. While we were getting our veggies last summer we significantly slashed both our grocery and eating out spending. All posts having to do with this project will have the $60/week tag – if you’re not interested in knitting or general navel-gazing, you can find posts that way. I hope you enjoy reading all about cooking and eating on a tight budget. * We are also lucky enough to have family, friends and loved ones who have treated us to things – meals, drinks, museum admissions, yarn at Spa, coffee gift cards, etc. – that have allowed us to have more spendy fun than we would be able to have otherwise. Gist and I are both extremely grateful for these gifts and the people that give them. *** The World Peas Cooperative, a part the New Entry Sustainable Farming Project, if you’re in Lowell you should sign up – it’s great! If you’re not in Lowell, you should look into a local CSA – they’re amazing for so many reasons. Thanks for stopping by–looks like you’ve got a lot of great stuff on your blog. Are you in Lowell MA? I love Trader Joe’s. It’s my duty to tell everyone. We don’t have a Basket near us…but if we did, I’d go based off of your glowing reviews. Anyway, I see you on FB with all the delicious things you make and it makes me jealous! I want to make yogurt and peanut butter pie and wowza. : ) You seem like a fab cook! Hi Courtney! Thanks for reading! Trader Joe’s does indeed rule! Hi! I’m just finding your blog today after following you on Twitter since the Globe did their zip code thing and boy am I glad I did! I’m next door to Lowell in a three Market Basket town and I also shop at that Hannaford’s so I’m chuckling at the photos. I’ll be reading from here on out! I read your blog pretty regularly, but this is the first time I’ve read this part. I can sooo identify with the difference between the two markets. I have refused to go the our discount market, simply because of the ambiance and crowds. Talk about spoiled! You’ve encouraged me to take another look. I need to get my grocery bill down, as well. Thanks. I just found your blog and I got it say, so inspiring in so many ways, you would not believe it, I’m trying to save as much as I can and reading about it in your blog was great, I’m adding you to my link! Hiya! I’ve just started a blog about Healthy living on a budget – from Wales in the UK! SO I was thrilled to be directed to your blog with your $60 a week project – as I’m sure I can garner ideas and tips for recipes even though we live on either side of the pond! I hope I can inspire you a bit too. Its so important that we try to find ways to eat healthy food and live a happy and healthy life during theses recession times, but I also hope that people continue such habits when there’s more prosperity too – for the sake of happiness regardless of material possessions, as well as the health and happiness of our planet! Wow. Very similar to our blog, except with the $60 part. Hope you’re doing great at the start of this year. I wish the Basket I shopped at was as good as the ones you must be going to. I go to the one on Fletcher and Broadway and their produce section disappoints me every time. Their organic section is very small and I despise the cellophane wrapped items (Talk about wasteful packaging). Also, forget about finding any local produce there. If I have the choice, I don’t buy produce there. Thank God for the Lowell Farmers Market! Otherwise, I’d be stuck taking the bus to Hannaford. I am also very disappointed in their meat section because I can’t find any organic meat at all (it’s at Hannaford). I wish that Market Basket would improve in these areas. I went to their website and was unable to find a place to leave comments or suggestions.